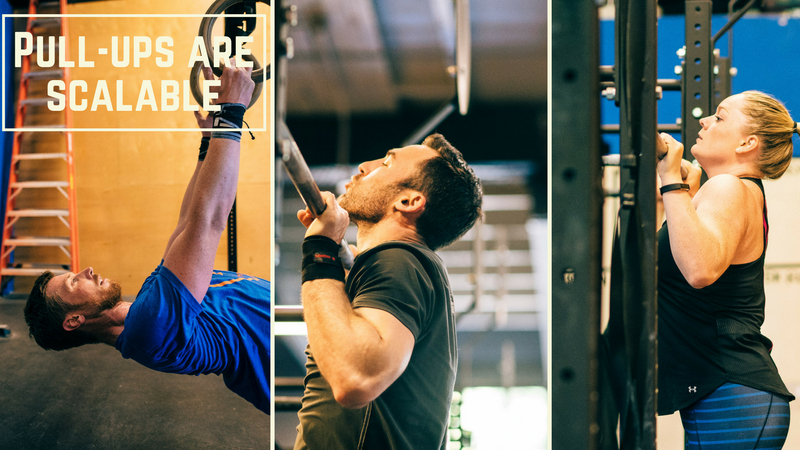 One of the most frequent questions we get is: Do I need to be able to do a pull-up to do CrossFit? The answer is an absolute NO. While the pull-up shows up in a majority of benchmark workouts (ex. “Cindy” and “Fran”), most members who walk into the gym cannot do a pull-up without assistance and will need to learn how to scale them. That is why we have talented coaches who will walk us through the modified versions of a movement. We sat down with Head Coach Adam Moore to ask him his tips for working to get a pull-up and when to scale. Be sure to sign up for the Gymnastics Seminar led by Adam and Danielle on Saturday June 2. All proceeds from the seminar will be donated to assist Val Cromer as she undergoes treatment for stage III breast cancer. During the seminar, Coach Adam and Danielle will be reviewing techniques to help you improve your gymnastics skills and drills to help you build strength. Do I need to be able to do a pull up to do CrossFit? Adam: Absolutely not! Almost everyone who joins the gym without much CrossFit experience does so without pull-ups, and they’re still killing it in classes! As a coach, I make sure to provide substitutions and options for members when movements need to be modified, pull-ups included. That said, it’s great to have the goal of getting your first pull-up (or maybe your first pull up since you were a teenager), and consistently following the programming at CrossFit West Seattle will definitely be a great help on that journey! Top tips for scaling a pull-up? Adam: Routine is the enemy! You want to vary your approach to pull-ups in order to develop well-rounded strength and capacity. Ring rows are great for building strict strength, holds and negatives build similar strength in the positions of the pull up, and jumping pull-ups and chest to bars can often allow for more repetitions and volume in your training as your legs are able to help, similar to a kipping pull-up.